Finding Mr. Mojo Risin' and a magical basement | Jon Katz, P.C. My family and I fly back tomorrow to Virginia from Paris. This week’s highlights in Paris relate to the importance in my law practice of drawing people into the entertainingly persuasive moment. I found Jim Morrison’s grave bedecked with fans’ gifts and wishes, and an astoundingly magnetic Magic Museum. Coming late to the Doors at the age of sixteen with the group’s music included in Apcocolypse Now, I have been hooked ever since. 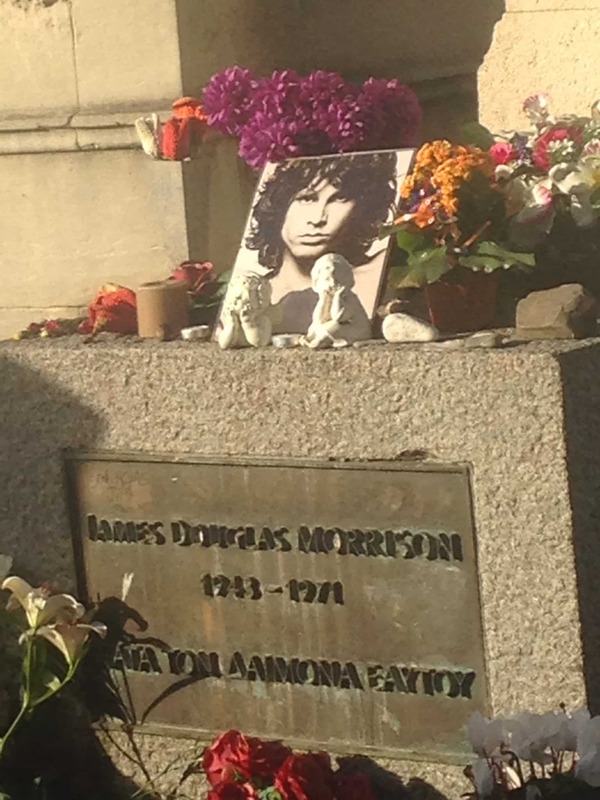 Jim Morrison left an amazingly captivating musical legacy during his short twenty-seven year life, with his poetry influenced in part by people buried in the same Pere Lachaise cemetery where Jim is interred. After reading Internet entries running from saying Morrison’s grave can take hours to find among the cemetery’s labarynthian paths to one 2006 posting saying to simply follow the cemetery map, I found it quickly by taking the Pere Lachaise subway exit, entering from Blvd. de Belleville after buying a cemetery map at the entrance, and taking the first main right, and two short turns by which time other visitors probably are usually seen congregating at the same grave. Jim’s grave is surrounded by low metal gates to reduce vandalism, but the gates are easily climbed, and I saw fresh flowers within (pictured here) and wishes and items tied to the metal gate’s slats. On the subway ride over, I made three origami peace cranes that I left through the opening of the fencing. A person of course is not his or her body, especially after leaving it. Nevertheless, the collective experience of probably over a million fans visiting this site over time makes for a particularly meaningful visit. The next day, today, my son and I took a shot at visiting the Musee de la Magie/Magic Museum and Automata Museum at 11 Rue St. Paul down the street from the Bastille subway stop. Wow! And it takes a lot to wow me with magic after practicing and performing as an amateur since 1974 and experiencing Doug Henning’s ultimate abilities and the wonders of the original Louis Tannen magic shop and magician’s hangout in Manhattan, ranging down to much lesser talent and quality. Founding owner Georges Proust, purportedly the world’s biggest collector of magic items, over twenty years ago opened a basement museum filled with antique magic props and posters, a hall of mirrors better than those at carnivals, pre-eletricity/battery automata/automated items like a face with a moving mouth and eyebrows that visitors can try by the push of a button, and more. We spent around two and a half hours at the museum, including its cool magic shop, where my son got a large screw with a nut that unscrews from it as if by a ghost’s hand together with a box that magically transforms a large die into four tiny ones. I bought for myself a pen/pencil holder that disappears real pens’ bottom halves and an automata prop on display at the museum of two men sawing a log in half, together with one of Proust’s French language magic instruction books for a nearby Maryland collector of magic antiques and old magic performance posters. I always am taken by great performers fully devoted to their art, which inspires me on the never-ending path of doing the same in my criminal defense work. 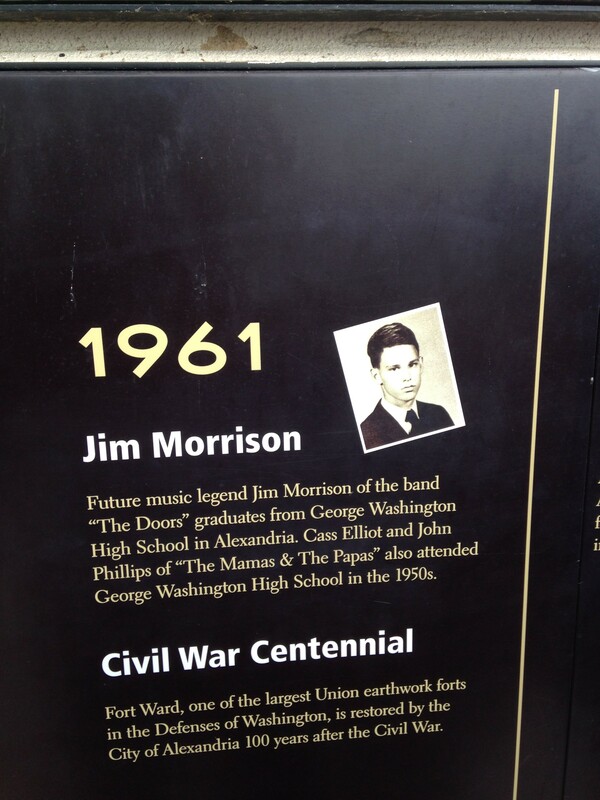 ADDENDUM: Jim Morrison graduated from Alexandria, Virginia’s then-racially segregated George Washington High School, in 1961. On January 1, 2015, at the Alexandria, Virginia, harbor, by happenstance I found this image of Jim Morrison on an informative visual timeline of Alexandria history at the Alexandria Old Town riverfront.